Located on Wall St in the heart of Lower Manhattan, Andaz Wall Street is 20 - 40 minutes away from John F. Kennedy airport. In from the massive blocks of Lower Manhattan, Andaz Wall Street's lounge is more of a retreat than a check-in area. Grab a cushy seat and wait for a representative to come to you with a complementary glass of wine and wireless check-in PC. What is this topsy-turvy world? Wait... who cares, let's not look a gift-horse in the mouth. 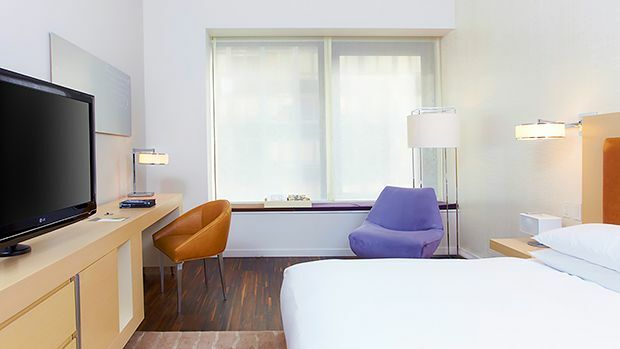 With 253 loft-style rooms featuring modern-yet-cozy furnishings, pillow menus, and plush king-sized beds, guests will prove there's exception to the "city that never sleeps" rule. Being New York, eating, drinking, and socializing are a huge part of this hotel's plan. Guests can savor a variety of international cuisines and cultures at the recently opened Andaz Wall Street Kitchen & Bar, or head to the outdoor beer garden for some cold brews in the spring and summer months. For those who work at least an eight-day week, Andaz offers plenty of meeting space, with five conference rooms, an innovative communal kitchen, free WiFi, and full AV capabilities. This is Wall St., after all. Send an availability request with your requested dates to the Andaz Wall Street. 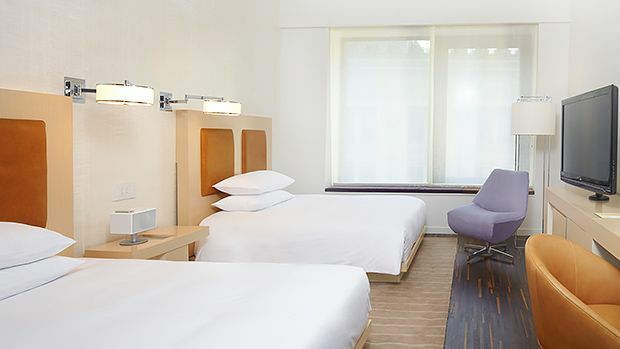 This loft-style room features 1 King bed, comfortable furnishings and complimentary Andaz amenities (including Wi-Fi Internet, non-alcoholic minibar, snacks and local calls). 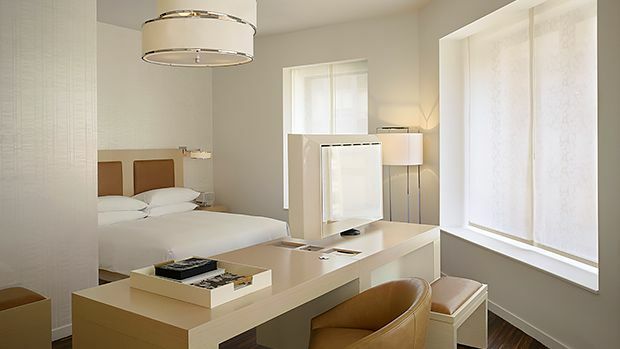 This loft-style room features 1 King bed, suite style bathroom including deep soaking tub and rain shower, rotating vanity and the complimentary Andaz amenities (including Wi-Fi Internet, non-alcoholic minibar, snacks and local calls). 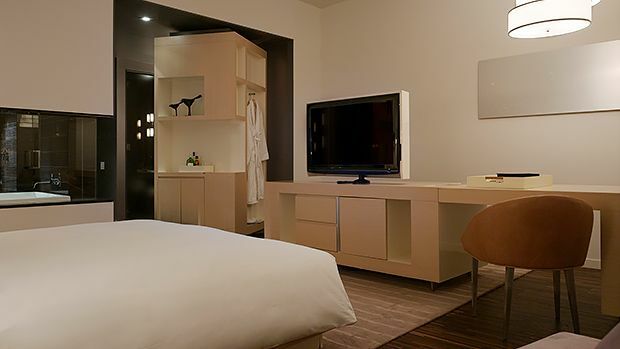 Loft-style corner room features 1 King XL bed, non-alcoholic minibar and Wi-Fi Internet. Loft style room featuring 2 Double beds and complimentary Andaz amenities (including Wi-Fi Internet, non-alcoholic minibar, snacks and local calls). Whether you are staying for business or pleasure, this loft-style suite overlooking Hanover Square offers all the comforts of home including a king bedroom with plush down duvets, comforters, deluxe bath with walk-in rain shower separate soaking tub and double vanities and separate sitting area and half bath for guests. After a long day in the city, put your feet up and rest your eyes on the intriguing Rockwell Group-designed interiors, featuring oak floors, bleached wood accents and locally crafted, transition-themed metal artwork. Enjoy two 42-inch LCD TVs, and complimentary extras including Minibar with snacks and non-alcoholic beverages, Wi-Fi Internet and local telephone calls. New York-style loft suite with 1 King bed, living room, soaking tub and rain shower along with the complimentary Andaz amenities (including Wi-Fi Internet, non-alcoholic minibar, snacks and local calls). These are corner rooms. This spacious suite contains 1 King bed, large sitting area with a walk-in rain shower, deep soaking tub and window seat. Deluxe complimentary Andaz amenities included. This spacious suite contains 1 King bed, large sitting area with a walk-in rain shower, deep soaking tub and a window seat. Deluxe complimentary Andaz amenities included. Features 1 King bed, two separate couch areas, two separate entryways and an oversized work desk. This is the most expansive suite with all the perks of the Andaz Large Suite along with multiple sitting areas and a furnished kitchen. This is the premium suite. This is the most expansive suite with all the perks of the Andaz Large Suite along with multiple sitting areas and a furnished kitchen. This is the premium suite. Features 1 King bed, 2 separate couch areas, 2 separate entry ways and an oversized work desk.